"Caleb Plummer and Bertha," fifth full-page illustration by Sol Eytinge, Jr., for the Diamond Edition of Dickens's "Christmas Books"
"Caleb Plummer and Bertha," the fifth full-page illustration for the volume by Sol Eytinge, Jr. 7.4 cm high by 9.9 cm wide. The Diamond Edition of Dickens's Christmas Books and Sketches by Boz, Illustrative of Every-day Life and Every-day People (Boston: Ticknor and Fields, 1867; rpt., James R. Osgood, 1875). The dual character study of the beloved Christmas Book characters from the Hungry Forties involves four key elements: the beautiful, blue great-coat (in fact, a sackcloth bearing the initials "G" and "T" for "Grim and Tackleton") hanging on the clothesline to dry (upper left); the large dolls' house upon which Caleb is working — "the four-pair front of a desirable family mansion" ("Chirp the Second," p. 105); the blind dolls' dressmaker, Bertha (left); and her crotchety father (lines of care imprinted on his face) at the work-table. One may see these same elements in the other significant illustrated editions of the novella: Richard Doyle's "Chirp the Second" (p. 54), John Leech's "Caleb at Work", p. 61 (both dropped into the text of the original 1845 Christmas Book), E. A. Abbey's "'Halloo! Halloo!' said Caleb. 'I shall be vain presently!'" (p. 88 of the American Household Edition), and Fred Barnard's 1878 British Household Edition illustration "'The extent to which he's winking at this moment!' whispered Caleb to his daughter. 'Oh, my gracious!'" (p. 93). In contrast to these detailed group scenes, Harry Furniss in his 1910 engraving for the Charles Dickens Library Edition isolates the elderly widower in "Caleb Plummer — The Toy Maker" (facing page 192), even though Furniss, too, is careful to include the (supposedly magnificent) coat, the dolls' mansion, and the work-table. In the midst of all these objects, Caleb and his daughter sat at work. The Blind Girl busy as a Doll's dressmaker; Caleb painting and glazing the four-pair front of a desirable family mansion. The care imprinted in the lines of Caleb's face, and his absorbed and dreamy manner, which would have sat well on some alchemist or abstruse student, were at first sight an odd contrast to his occupation, and the trivialities about him. But, trivial things, invented and pursued for bread, become very serious matters of fact; and, apart from this consideration, I am not at all prepared to say, myself, that if Caleb had been a Lord Chamberlain, or a Member of Parliament, or a lawyer, or even a great speculator, he would have dealt in toys one whit less whimsical, while I have a very great doubt whether they would have been as harmless. "So you were out in the rain last night, father, in your beautiful new great-coat," said Caleb's daughter. "In my beautiful new great-coat," answered Caleb, glancing towards a clothes-line in the room, on which the sack-cloth garment previously described, was carefully hung up to dry. "How glad I am you bought it, father!" "And of such a tailor, too," said Caleb. "Quite a fashionable tailor. It's too good for me." The Blind Girl rested from her work, and laughed with delight. "Too good, father! What can be too good for you?" "I'm half-ashamed to wear it though," said Caleb, watching the effect of what he said, upon her brightening face; "upon my word! When I hear the boys and people say behind me, 'Hal-loa! Here's a swell!' I don't know which way to look. And when the beggar wouldn't go away last night; and when I said I was a very common man, said, 'No, your Honour! Bless your Honour, don't say that!' I was quite ashamed. I really felt as if I hadn't a right to wear it." Happy Blind Girl! How merry she was, in her exultation! "I see you, father," she said, clasping her hands, "as plainly, as if I had the eyes I never want when you are with me. A blue coat —"
"Yes, yes! Bright blue!" exclaimed the girl, turning up her radiant face; "the color I can just remember in the blessed sky! You told me it was blue before! A bright blue coat —"
"Made loose to the figure," suggested Caleb. "Yes! loose to the figure!" cried the Blind Girl, laughing heartily; "and in it, you, dear father, with your merry eye, your smiling face, your free step, and your dark hair — looking so young and handsome!" 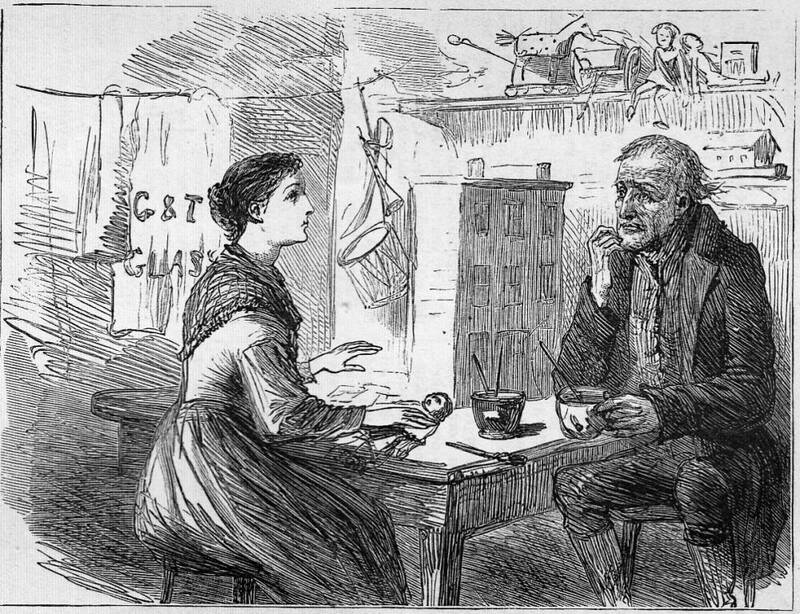 Eytinge's toy-making scene unites father and daughter in a common occupation, so that their workspace which places them in close proximity is the workaday equivalent of the Peerybingles' domestic hearth in the previous illustration. Although less well modelled than the figures in the later editions, Eytinge's toy-makers are more realistically realised than those of Doyle and Leech. However, what Eytinge has sacrificed in order to render the pair realistically is the imaginative detailing that supports the reader's engagement with the marginalised figures: the gigantic rockinghorse and toys swirling in mid-air in Doyle's fanciful composition to suggest that these objects are the products of artistic imaginations, and the enormous stock of toys and dolls that crowd in upon the figures in Leech's to constitute their only companions and family. What Eytinge gains is a sharpened focus on the father and daughter, and a subtle sense of Bertha's sightlessness as she stares vacantly in the direction of her father's voice. Perhaps the drum and bugle behind her (centre) imply her acute sense of hearing, even as the text underscores her inability to see Caleb as he really is. Bentley, Nicolas, Michael Slater, and Nina Burgis. The Dickens Index. Oxford and New York: Oxford U. P., 1988. Davis, Paul. Charles Dickens A to Z: The Essential Reference to His Life and Work. New York: Checkmark and Facts On File, 1998. Dickens, Charles. The Christmas Books and Sketches by Boz. Il. Sol Eytinge, Jr. Engraved by A. V. S. Anthony. The Diamond Edition. Boston: Ticknor and Fields, 1867. Dickens, Charles. The Cricket on the Hearth: A Fairy Tale of Home. Il. John Leech, Richard Doyle, Daniel Maclise, Edwin Landseer, and Clarkson Stanfield. London: Bradbury and Evans, 1845. Dickens, Charles. Christmas Books and Sketches by Boz Illustrative of Every-day Life and Every-day People. Il. Sol Eytinge, Jr. The Diamond Edition. Boston: Ticknor and Fields, 1867. Rpt., Boston: James R. Osgood, 1875. Dickens, Charles. Christmas Books. Il. Fred Barnard. The Household Edition. London: Chapman and Hall, 1878. Hammerton, J. A. The Dickens Picture-Book. The Charles Dickens Library edition. London: Educational Book Co., 1910. Kitton, Frederic G. Dickens and His Illustrators. 1899. Rpt. Honolulu: U. Press of the Pacific, 2004. Winter, William. "Charles Dickens" and "Sol Eytinge." Old Friends: Being Literary Recollections of Other Days. New York: Moffat, Yard, & Co., 1909. Pp. 181-207, 317-319.